The new FIA Hall of Fame was inaugurated yesterday in Paris by the world’s motorsport regulator. All 33 Formula One champions are the first inductees into the Hall of Fame, with nine of them being present at the inauguration ceremony. F1 champions Sir Jackie Stewart, Mario Andretti, Alain Prost, Nigel Mansell, Damon Hill, Jacques Villeneuve, Fernando Alonso, Sebastian Vettel and Nico Rosberg participated in the event at the headquarters of the ACF in Paris, together with representatives and families of F1’s other title winners. “The FIA Hall of Fame has been created to highlight the values that run through motor sport and the champions who have been and who still are the exemplars of the FIA’s values of commitment, integrity, respect and sportsmanship.This is the first stage of an ambitious project: the FIA Hall of Fame will soon expand to the FIA headquarters in Geneva, and other champions and other disciplines will be in the spotlight in the coming years. 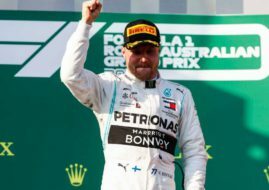 In this way we will celebrate all the FIA champions who have made, and who still make the history of motor sport so incredibly rich and inspiring,” FIA President Jean Todt said. The inauguration also saw the launch of the FIA Hall of Fame website, where the achievements of those inducted will be celebrated in order to help inspire the legends of the future. The FIA Hall of Fame gallery in Paris has been created by Wilmotte and Associates, a prominent global architecture firm headquartered in France, and will be open to the public upon reservation. Here’s the list of all Formula One champions, with their breathtaking life stories: Giuseppe ‘Nino’ Farina, Juan Manuel Fangio, Alberto Ascari, Mike Hawthorn, Jack Brabham, Phil Hill, Graham Hill, Jim Clark, John Surtees, Denny Hulme, Jackie Stewart, Jochen Rindt, Emerson Fittipaldi, Niki Lauda, James Hunt, Mario Andretti, Jody Scheckter, Alan Jones, Nelson Piquet, Keke Rosberg, Alain Prost, Ayrton Senna, Nigel Mansell, Michael Schumacher, Damon Hill, Jacques Villeneuve, Mika Hakkinen, Fernando Alonso, Kimi Raikkonen, Jenson Button, Sebastian Vettel, Lewis Hamilton and Nico Rosberg.